A smart siren f with smart design. 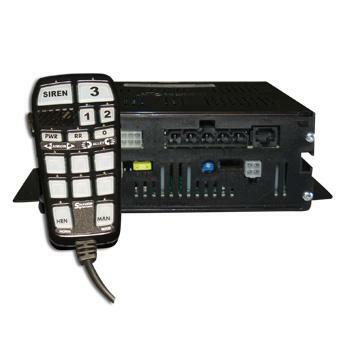 The new SoundOff Signal nErgy 400 series sirens are a highly programmable line of sirens that can control all of your dash lights, lightbars, grill lights and other auxillary equipment. With a total of eight auxilary buttons for easy one-touch programming and a three-position slide switch to allow convenient switching for the most frequently used warning modes. The styling of the new switch panel and the graphics fit nicely with the interiors of newly designed vehicles. Get LED, alley and arrow hand held switch indicators for easy convenient viewing. Extensive programability and a 200 watt dual-tone option. IMPORTANT NOTICE TO INSTALLER: Make sure to read and understand all instructions and warnings before proceeding with the installation of this product. Ensure the manual and all warning cards are delivered to the end user of this equipment. The ETSA46(x)HPP is a remote mounted siren amplifier designed for a single (ETSA461) or dual (ETSA462) external speaker. The amplifier box is controlled with a hand held remote containing a noise-cancelling microphone for PA use. The ETSA462 contains a 2 channel amplifier for driving 2 independent sounds. The ETSA461 is a single 100w design. The controller offers 3 multiple programmable levels as well as 8 independently controlled accessory switches. Sirens provide an essential function of an effective audio / visual warning system. However, sirens are only short range secondary devices. The use of a siren does not insure that all drivers can or will abide by or react to an emergency warning signal, especially at high rates of speeds or long distances. The operator of the vehicle must never take the right of way for granted and it is the operator’s responsibility to proceed safely.The effectiveness of this siren system is highly dependant on the correct mounting and wiring. The installer must read and follow the manufacturer’s installation instructions and warnings in the manual. The vehicle operator should verify the siren system issecurely fastened to the vehicle and properly functioning. Effective sirens generate loud sound pressure levels that can potentially cause hearing damage. Installers and those around the vehicle need to be aware of the dangers and wear hearing protection whenever the siren system is operating. Vehicle operators and occupants should assess their exposure to siren noise and determine what steps need to be taken to prevent hearing damage. The siren system is intended for use by authorized personnel only. It is the user’s responsibility to ensure they understand and operate the emergency warning devices in compliance with all applicable city, state, and federal laws and regulations. SoundOff Signal assumes no liability for any loss resulting from the use of the siren system. Mounting -Amplifier Installation- Before drilling holes, check for clearance to prevent damage. Check both sides of the mounting surface before drilling and the be aware of any vehicle components or other vital parts that may be damaged during drilling. Install grommets in any wire passage holes. 1. Slide ¼” hex head bolts into siren amplifier t-slots. 2. Place mounting brackets over bolts. 3. Thread ¼” lock nuts onto bolts and tighten down. 4. Use mounting bracket holes to secure amplifier. 5. Install amplifier with clearance from other objects for improved ventilation.